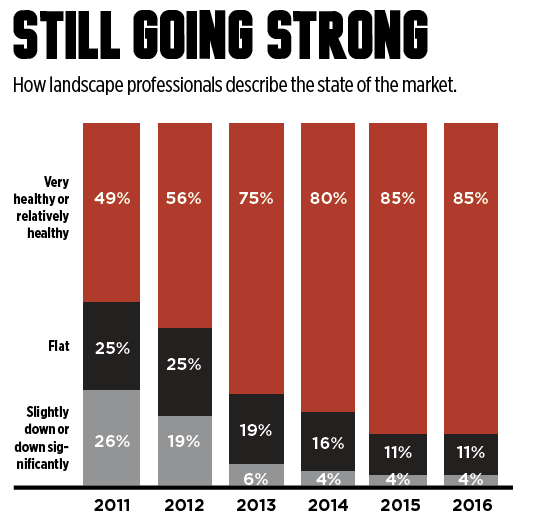 Landscape professionals report stability and growth in 2016. For the 2016 Industry Pulse report, LM surveyed subscribers online in October and November garnering 422 responses. Respondents were offered the chance to win one of three $100 gift cards as an incentive. Based on the number of responses, we assume a +/- 5 percent margin of error. Unless otherwise noted, all charts and figures in this report come from this survey. The landscape industry is standing on solid ground. By all accounts—the results of our exclusive Industry Pulse research, the interviews we conducted to complete this report and the conversations we’ve had with many landscape professionals and industry suppliers—it’s been a strong year and 2017 is expected to be the same. 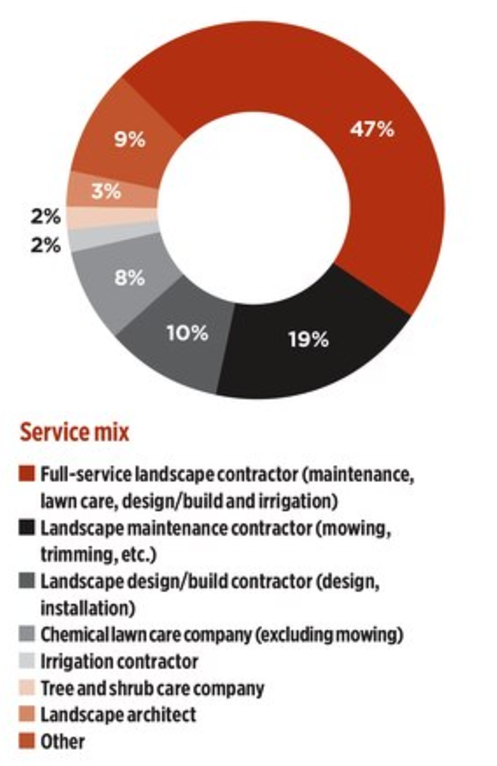 In fact, 85 percent of landscape professionals surveyed said the landscape industry is “very or relatively healthy” and more than 90 percent said they were “very or somewhat” optimistic about next year. These results mirror last year’s sentiments. Seven in 10 companies report they’ll meet or beat their annual revenue goals this year—anticipating an average growth of 16 percent in 2016 over last year. 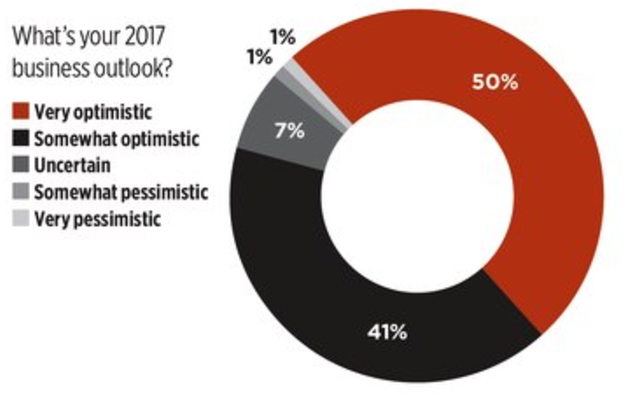 Majority of companies report they’ll see double-digit profits this year; 11 percent say they’ll be in the red. Two-thirds will meet or beat their profit goals, 20 percent won’t hit their targets, and still, perhaps unsurprisingly for an industry with a low barrier to entry, 15 percent of respondents said they don’t have a budget for net profit. Greenup in Houston, Texas, is growing at a steady clip, says Harold Zick, owner. With about $2.5 million in annual revenue, the company has grown 15-20 percent per year, even through the recession. But it’s not without challenges, the top one being finding employees. 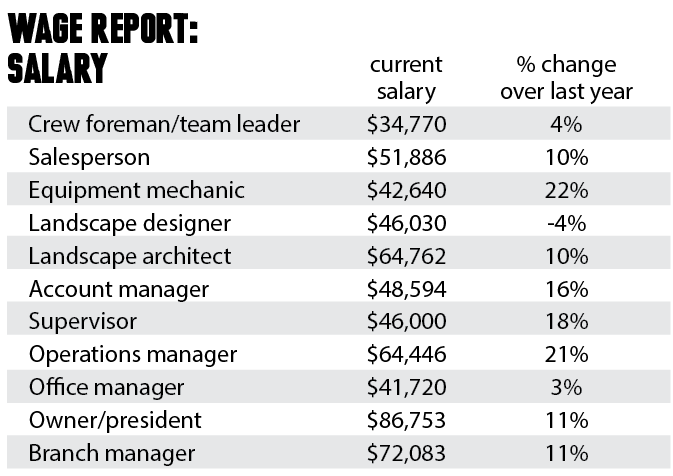 In fact, labor woes top landscape professionals’ lists of things that are an obstacle to growth. “Qualified labor is probably our limiting factor—finding good people and making sure they show up every day, on time, ready to work,” says Brandon Fusaro, who co-owns Worcester, Mass.-based Twins Lawn Service with his brother, Mike. Otherwise, the full-service company is having its best year yet, tracking $300,000 with its sights set on hitting a half million next year. Even for companies that aren’t shooting for major growth year over year, labor is still a concern. Take Nicole Lachance, owner of Bird’s Eye View Design in Asheville, N.C. She’s happy with her company’s scope and size, doing less than $200,000 providing specialized horticultural services for residential clients with her two-man crew, but if she wanted to grow more, she says would be limited in her ability to find good workers. For Allan Wittur, owner of Nevaeh Group of Cos., comprised of a landscape maintenance company and an irrigation company in Victoria, B.C., finding and keeping good employees is an obstacle, but it’s not a major concern. What he calls his top “Maalox moment” is when there’s “a little month at the end of the money.” In other words, capital is a challenge. 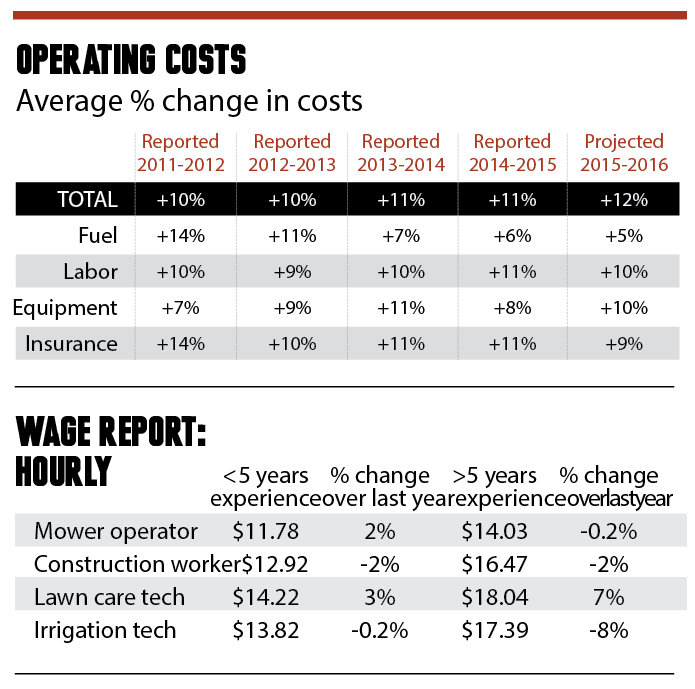 Although the Industry Pulse survey shows landscape professionals are expecting a 12 percent increase in operating costs this year, most contractors report minor news on the expenses front. 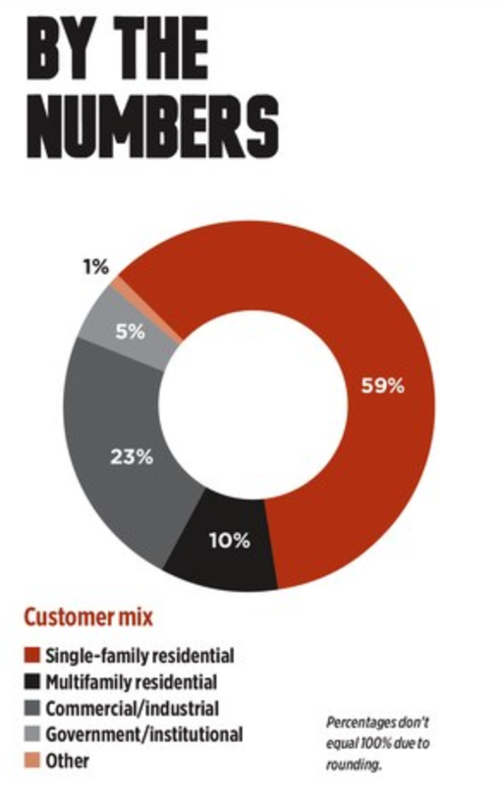 Fuel—always a big talking point—is a nonissue for most companies this year. “Fuel stayed low for us this year, so we were really blessed,” says Chad MacAvery, general manager of Yardworks in Emerald Isle, N.C. The full-service, primarily residential company runs diesel trucks and gas equipment. Throughout the country, most landscape contractors sang the same tune. The same goes for other cost categories. There were a few regional anomalies—for example, MacAvery is seeing a sod shortage in his area—but overall, professionals reported steady pricing in most categories of equipment and supplies, with the exception of plants, which most companies have come to expect to get more expensive and become more difficult to acquire every year. Daniel McCurry has found some savings buying direct from the grower instead of working with rewholesalers. “We still use our broker for specialty plant materials, but buying some of this stuff direct, we’re finding way better prices,” says the owner of Father Nature Landscapes in Birmingham, Ala., which focuses on high-end residential landscape renovation and garden maintenance. When it comes to insurance, most companies are reporting stable workers’ comp and liability prices. To keep things this way, MacAvery advocates putting insurance out to bid every year. Not surprisingly, companies also report labor costs rising, in part as a function of worker supply and demand. Zick estimates his labor costs rose about 3 percent this year. LM Industry Pulse research shows little or modest changes over last year’s wages for hourly workers, but the figures for salaried employees reveal many double-digit increases. These large jumps indicate the competitiveness of the labor market or perhaps employers reacting to the Department of Labor’s overtime rule, which was slated to go into effect with a new salary threshold for overtime at $47,476, up from $23,600, but was stopped by a federal judge days before the Dec. 1 deadline. Even with some uncertainty related to regulations and a new presidential administration, most landscape professionals aren’t worried.